Spinorama s-148. The New Singing Sensation LP with The Little People, The Bell Rings, In My Own Quiet Way, Our Last Night Together, Where Did You Go Last Night, River of Silver. 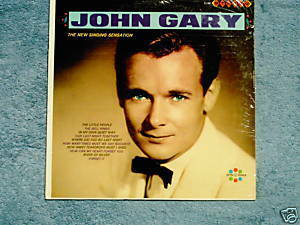 New Orleans born vocalist with three-octave voice; Gary's TV career includes his own show, the Tonight Show, Hollywood Place, Como, and Ed Sullivan. A singer's singer. Mezzo voce. Sealed LP with two thin splits in the shrinkwrap; cover is VG with some corner wear.